Make their birthday even sweeter with this sparkling gift box of amazing birthday candies. 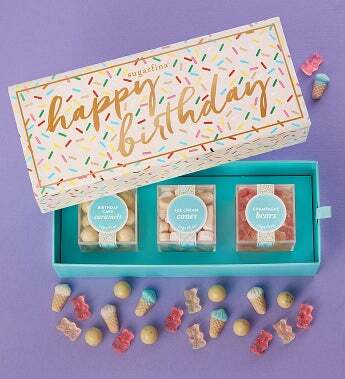 Includes three adorable lucite boxes of Sugarfina's most popular sweets: Champagne Bears®, Ice Cream Cones, and Birthday Cake Caramels. They are beautifully packaged in a festive confetti pattern keepsake box that says "Happy Birthday" in shimmery gold foil. Sugarfina, founded by a couple who love candy and each other, was named one of the world's 50 most innovative companies in 2018 by Fast Company. Celebrate deliciously! Birthday Cake Caramels - Make their birthday really special with these celebratory birthday cake caramels rolled in tiny rainbow sprinkles. An artisan caramel center is dipped in creamy white chocolate, then infused with a colorful splash of rainbow confetti. The perfect treat to say "happy birthday" to someone sweet. Ice Cream Cones - Treat them to a refreshing scoop of gummy goodness, with these adorable candies that are in the shape of classic ice cream cones complete with the waffle cone look. They'll love the delicious flavors of strawberry, raspberry and vanilla waffle cone. Champagne Bears® - Made with Dom Pérignon Vintage Champagne, these sophisticated bears sparkle in flavors of classic Brut and fashionable Rose. Named "the perfect party favor" by Cosmopolitan magazine, these grown-up gummies are the finest bears in all of candy land. A Sugarfina exclusive. Non-alcoholic and available to ship to any state.